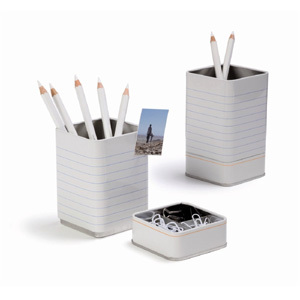 Tidy Desktop is a multi-functional desk organizer with a pen holder that doubles up as a magnetic board. Below there is a hidden compartment to store stationery clutter. The memo board can be used to display short note or images and is a handy place for keeping a To Do list. The desk tidy comes with some essential office accessories already included: two mini magnets, paper clips and binder clips. Compact and ultra useful, Tidy Desktop is perfect for those who like having an organized and minimalist work space. 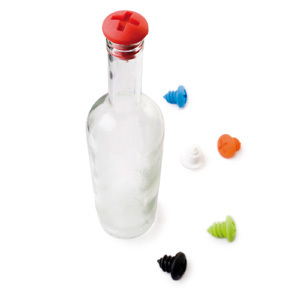 Bottle Screws Wine Bottle Stoppers are the solution for keeping your started bottles of wine fresh. Designed by Ori Saidi and Dani Gassner, these colourful wine stoppers shaped like screws are made of silicone and will fit most wine bottles. Bottle Screws come as a set of two and are available in black and white or red and orange. Wire Blooms Cable Tidy Clips are decorative nail-in cable clips that make unsightly wires and cables more attractive. You may not be able to get rid of unsightly wires, but the Wire Blooms cable management system designed by Laliv Shalev is a creative way to turn your wires into a room decor feature. 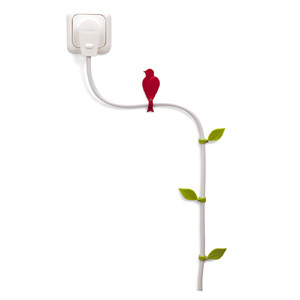 The cable clips are designed to look like twelve bright green leaves and one red bird; and the set comes complete with nails and adaptors for thinner cables. Wireblooms are the essential accessory for your modern office and make a great housewarming gift idea. The Toothy Cable Tidy is a cable management system that keeps your wires organized and prevents cluttered and tangles wires around your desk. Simply attach Toothy to the edge of your desk or shelf and use its teeth to hold your wires. Depending on your preference, it can be installed with teeth pointing upwards or sideways. 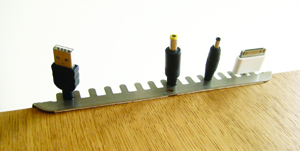 Designed by Hemal Patel, the different gap sizes between the teeth allow for cables of varying width to be held securely. And it will save you the hassle of kneeling on the floor, or searching behind your desk for fallen cables. The cable management system comes as a set of two and is easy to isntall. Either use the double-sided tape (supplied) to adhere it to your work surface, or secure with a screw for permanent fixing. The Slowcooker by Margriet Foolen for Royal VKB enables you to cook fresh ingredients without the need for oil. The slow and gentle cooking process itself tenderises the ingredients and releases their full flavours. 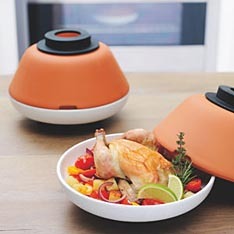 Based on the traditional Moroccan tagine this award winning design is produced in terracotta. It absorbs and holds in moisture, steaming the food slowly and evenly, preserving all the original vitamins, minerals and flavours. The ingenious Slowcooker consists of two interlocking bowls which are reversible. The white bowl is ideal when it’s a meal for one. And when cooking for two or three people, just flip it over to cook your fresh ingredients in the larger bowl. With silicone rings at the base of each dish, the Slowcooker works as oven to tableware. The white lid doubles up as a plate, and the terracotta bowl as a serving dish. Recipient of several design awards including Designplus, Reddot and a Wallpaper 2010 design award, the Slowcooker comes with instructions and a recipe book.